Sir John Beazley (1885-1970) made about 1500 drawings from Athenian vases during the first decades of the twentieth century. Most have not been published. The following pages are a preview of the program which will make this collection, now in the Beazley Archive, widely available for the first time later this year. Drawing from the vase by Sir John Beazley. 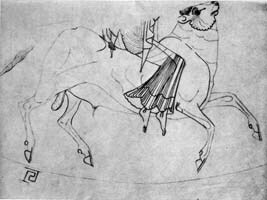 The drawings were executed in pencil on tracing paper. The lengthy and painstaking procedure of transforming the tracings into finished drawings was described by Dr Dietrich von Bothmer in D.C. Kurtz, The Berlin Painter, Drawings by Sir John Beazley (Oxford, 1983). Beazley made the drawings to help himself to identify the personal style of individual vase-painters working in the potters' quarter in Athens more than 2500 years ago. 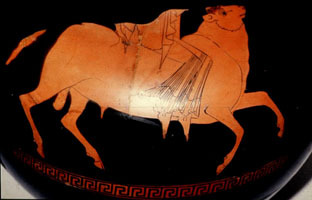 Almost all of Beazley's drawings are from vases decorated during the fifth century BC in the technique known today as red-figure. The black background of this technique obscures the outlines of the red figures, and its high gloss reflects light. The tracings enabled Beazley to reveal lines which can elude even professional photography and close personal inspection. In the older black-figure technique both the outline and inner detail are normally clearly visible; the drawings were unnecessary.